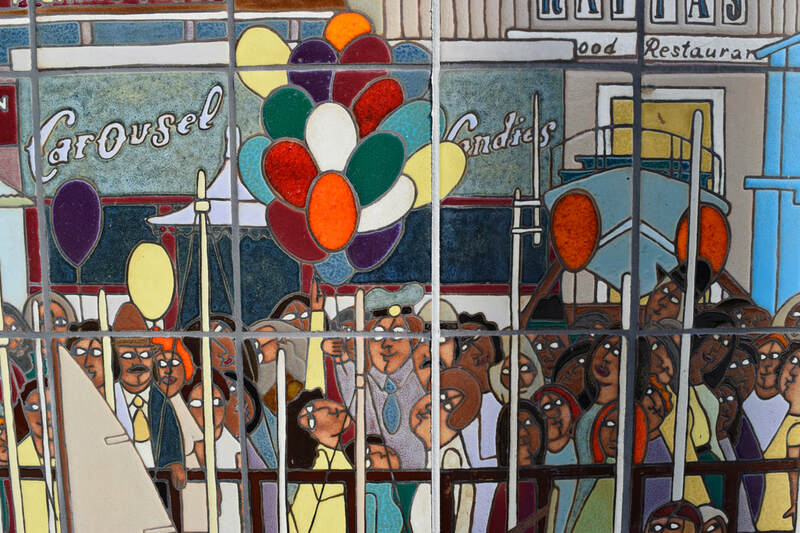 When Granizo started creating his various styles of art, he always did it with the mindset that his art was for others to enjoy. 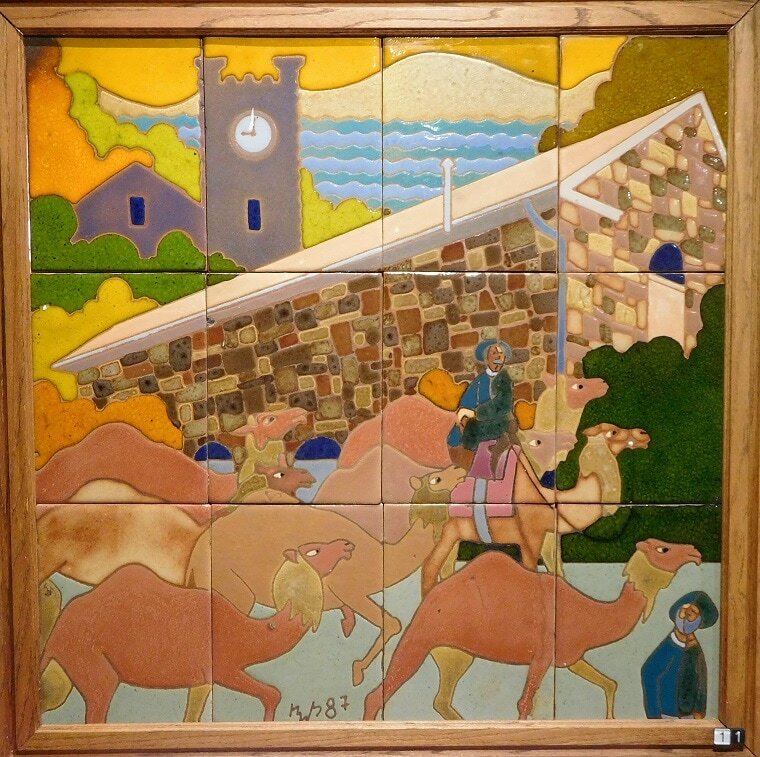 There was always a sense of life and culture in his work and he loved to use vibrant colors to make each painting come alive. Each mural that he was commissioned to do inspired him to do more and while he did many commissions, he also did many paintings for friends and collectors. One of his friends, Joe Taylor, President of the Tile Heritage Foundation once said, "one of the charms of Granizo's tiles is their humor. There is a great sense of lightness and puzzlement in them and they're fun. 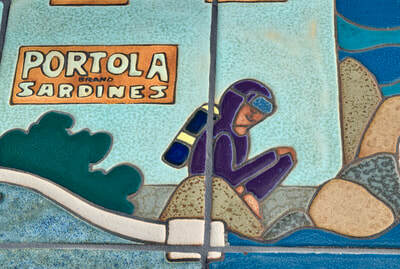 In late 1980 Granizo moved to Benicia, California, where he spent the last two decades of his life. 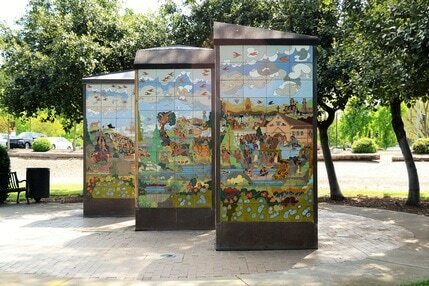 The City of Benicia (formerly the state capital of California) became the center of "Bill's" art world and Benicia has honored him in many ways by recognizing his art as a part of its city. 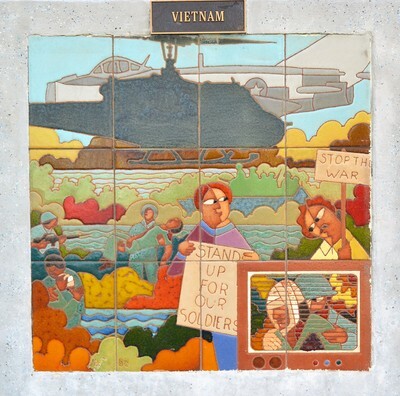 In particular, the Benicia Historical Museum has been very supportive of his work by dedicating a section of the museum to him. 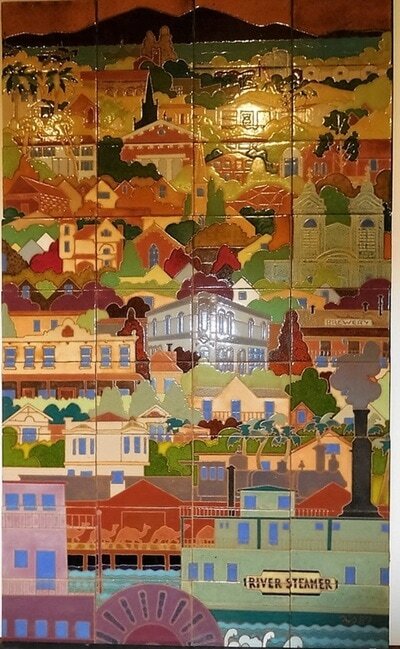 From Granizo's study of the history of Benicia as the original capital of California, he began creating a series of tile murals that the city placed in the sidewalks and civic buildings. 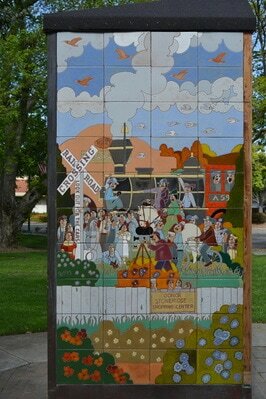 Each mural depicted the historic landmarks, people and events that took place in the early part of the development of Benicia. 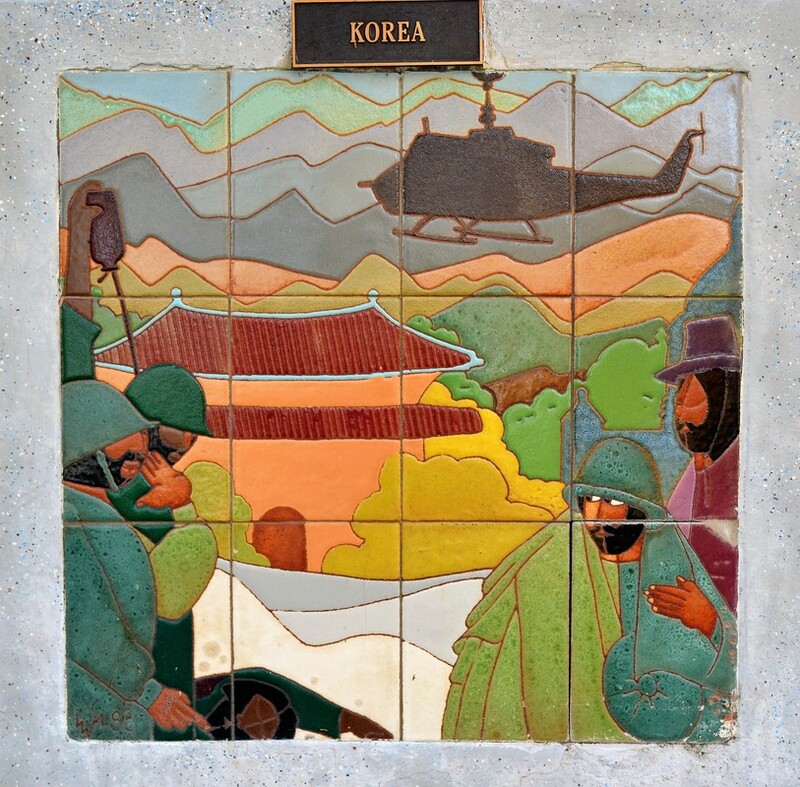 With the historic military influence of Benicia and its Arsenal, some murals honor the American soldiers who fought in World War I, World War II, Korea and Vietnam. Garfield and Granizo later became close friends and was the first person to create the first website about Granizo's illustrated autobiography which can be found under the Autobiography tab on this site. 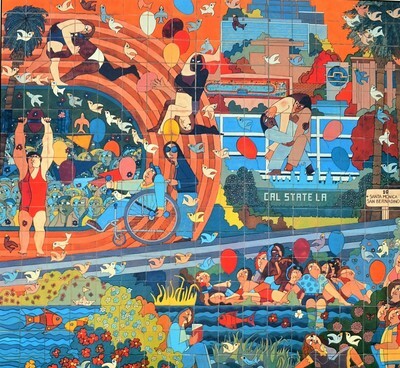 The 1984 Olympics came to Los Angeles and Granizo was commissioned to do a mural that was the largest he had ever created. 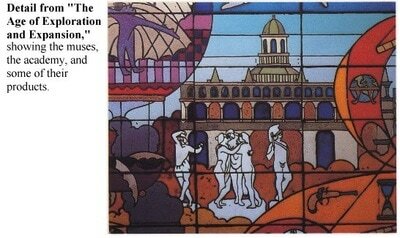 The mural was 93 feet long and 24 feet high and was to be called the "Olympic Fantasy". 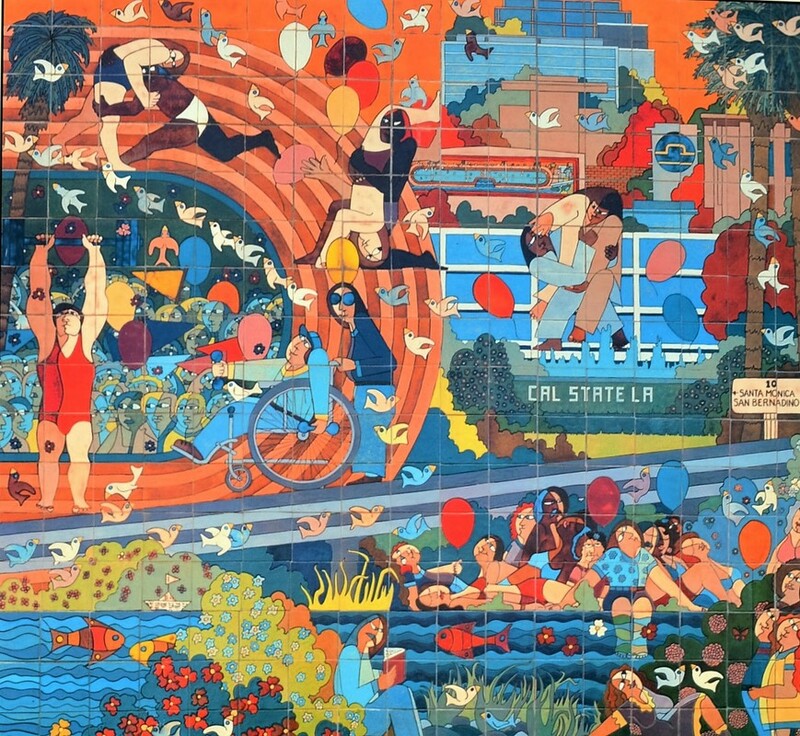 California State University in Los Angeles was selected as one of the Olympic event sites. 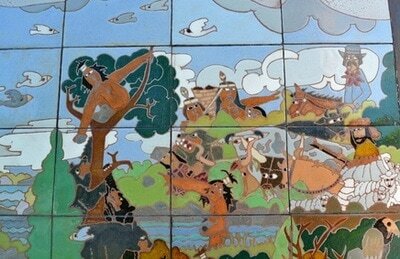 The mural was attached to the side of the gymnasium where some of the events include Judo and Wrestling were held. 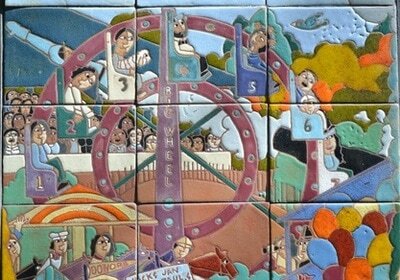 The mural was designed to include all of the sports represented in the Olympics. Granizo was so excited about this mural that he created it in 10 weeks time barely sleeping throughout it's completion. This mural dedicated to the City of Monterey in 1984 is a beautiful illustration of the Monterey area. 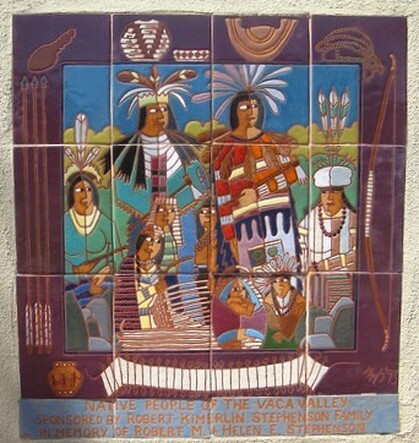 Illustrations include it's rich history including native Rumsen Indians who lived there thousands of years ago and continues with the historical documentation of many events of the area. 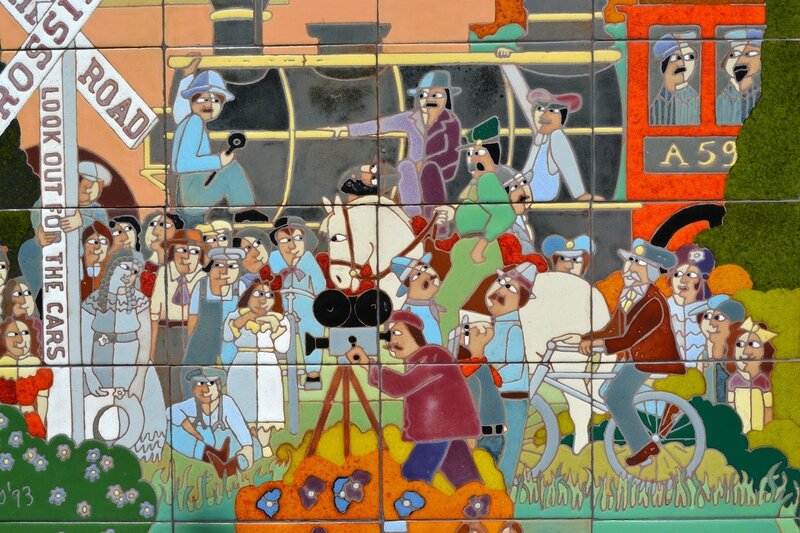 Also included is Father Junipero Serra who founded the mission in Monterey, the Spanish attacking in the early 1800's and the historical developments that took place there up until 1983..
Near the upper right had corner of the mural, Granizo depicts three men in a hot air balloon (Bing Crosby, Samuel Morse (Del Monte) and John Steinbeck). 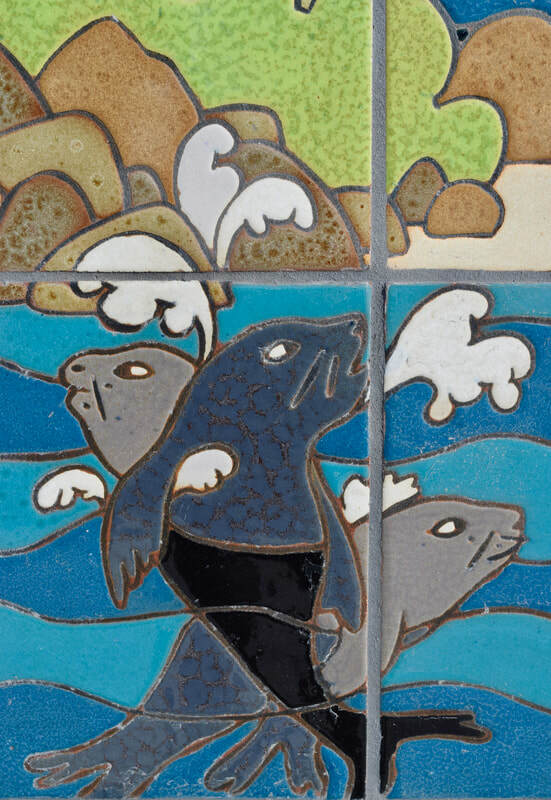 Granizo included them to depict these three men as major contributors to the development of modern day Monterey. 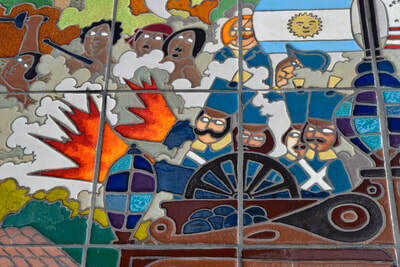 It was Granizo's way of denoting a bit of modern history in a whimsical way. 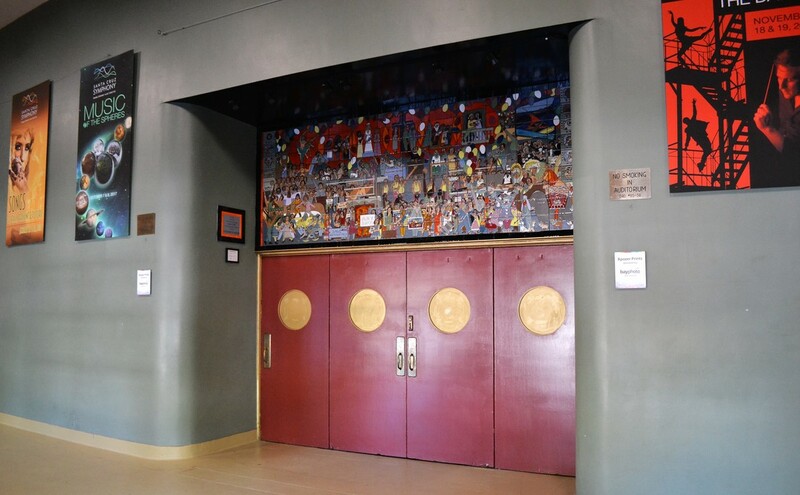 In 2015, the mural was taken down from the convention center where it resided to make way for a more newer more modern facility. 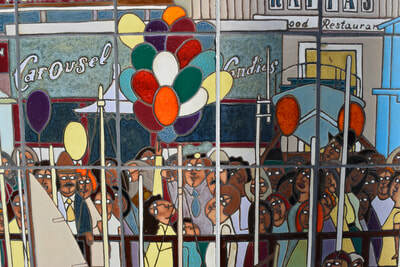 Once the new center is completed, the mural will be reinstalled in the first quarte in 2018. 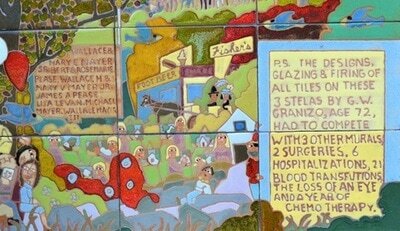 Even Dennis the Menace lived in Monterey! Granizo joined famous Napa Valley art glass designer Gaye Frisk in a venture commissioned by Winemaker Randy Dunn at Dunn Vineyards. 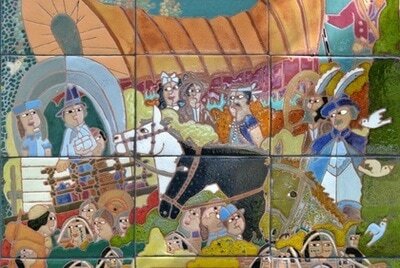 Granizo produced limited edition ceramic paintings for "The Artist Series". 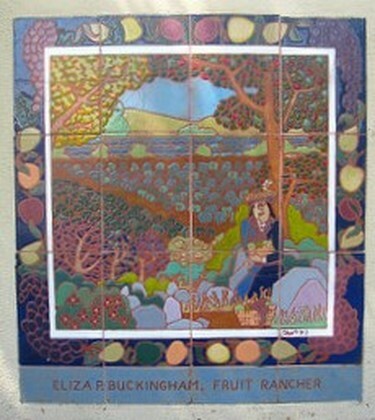 and Gaye then translated Granizo's artwork onto beautifully designed bottles for Dunn's Fine wine. 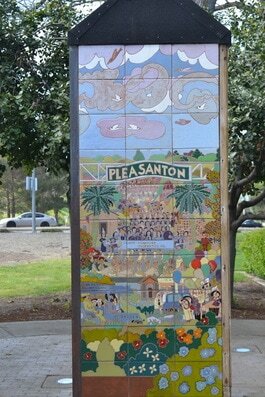 Celebrating the "Pleasanton Centennial" in 1994 Granizo was commissioned to create a public art display that was a pictorial history of the area's rich heritage. 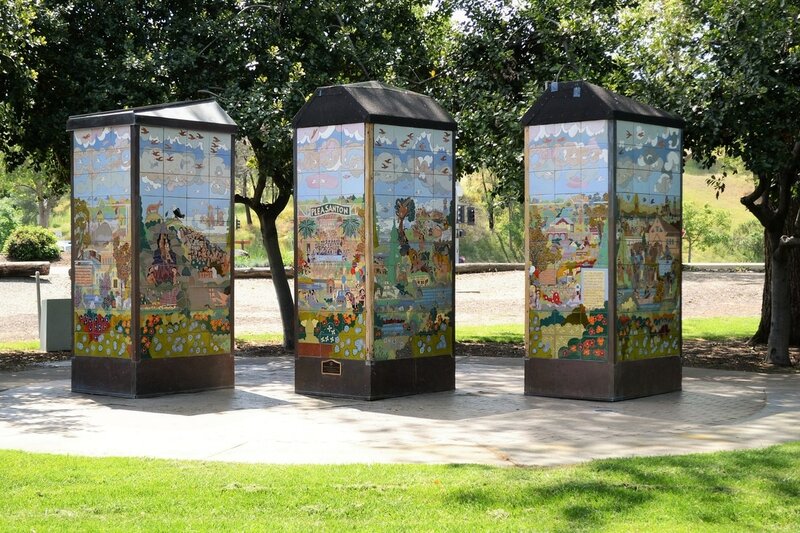 This project consists of three rectangular columns or "stelae" placed diagonally. When viewed together from any side of the pillars, the three columns align to form a single mural. 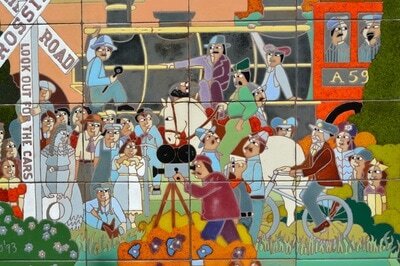 The murals depict four perspectives of the areas heritage to include its history, culture, agriculture, movie making and commerce. 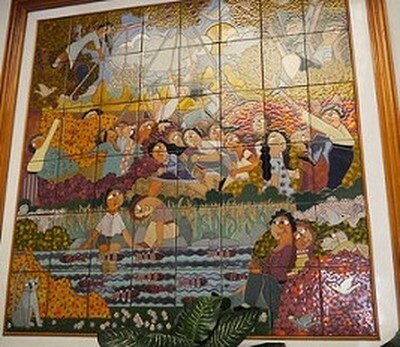 This piece of art is extremely significant to Granizo's work because it was one the last one's that he did. 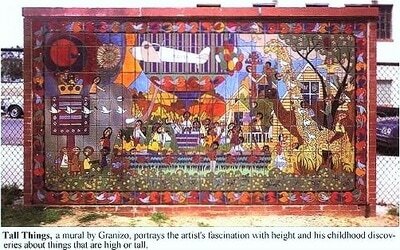 During the creation and completion of this project Granizo battled with cancer and passed away shortly after this project was dedicated. 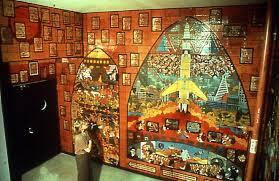 His family often visits this site and remembers his last days when he would sit and watch the instillation of the murals. These murals are located at Civic Park, 100 Main St. in Pleasanton, Ca. The City by the Bay. 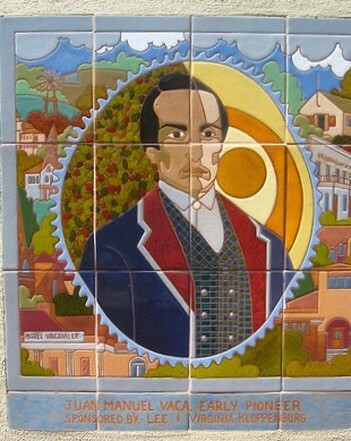 San Francisco is where Guillermo Wagner Granizo was born and lived when he returned from Central America at the age of 12. 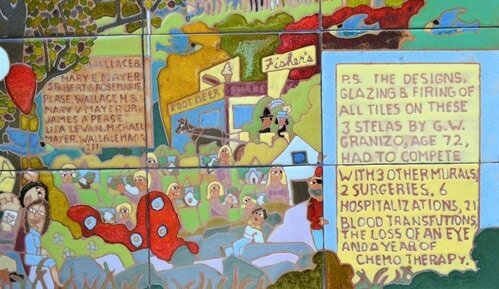 Below are some murals and paintings in San Francisco that he created but none more beautiful than "Panorama of San Francisco" created in 1980. 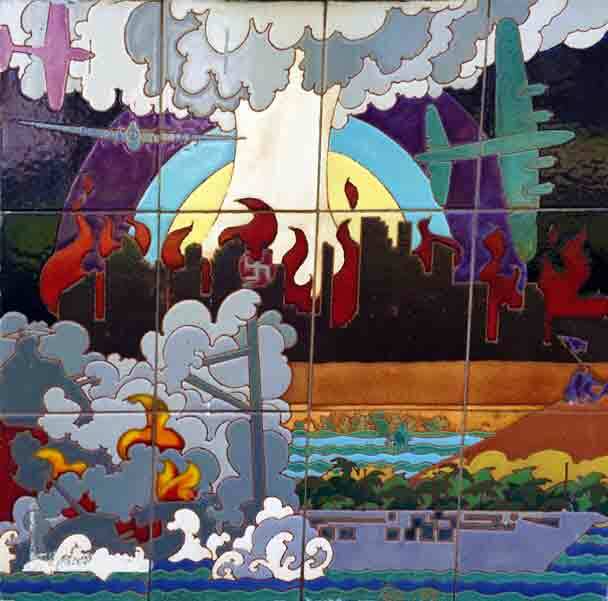 This mural was originally displayed on the side of a building that housed Harcourt Galleries in an alley just off Powell St. Granizo and his agents looked for the right buyer for this piece but the mural was 18' x 14'. 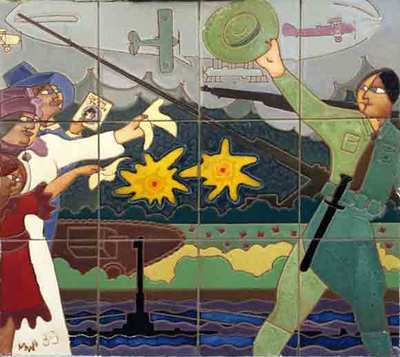 Granizo's eldest son decided to print posters of the murals and while doing so offered to place the "Panorama" mural at the San Francisco Airport. The donation had to be approved by the San Francisco Art Commission and then the SFO Airport Commission. 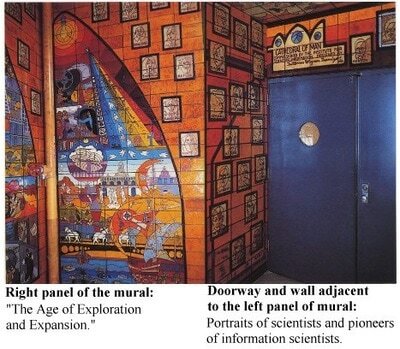 In the meantime, the mural was being stored in a warehouse and sadly, the mural was destroyed. 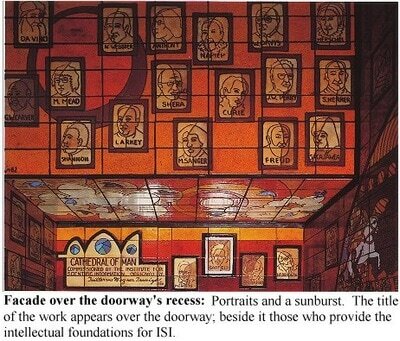 Only small sections of the mural remain and are held by the family. 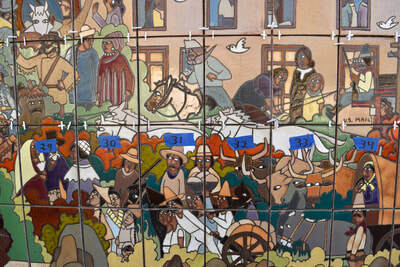 Other murals can bee seen at Mission Dolores and in some in private buildings around town. 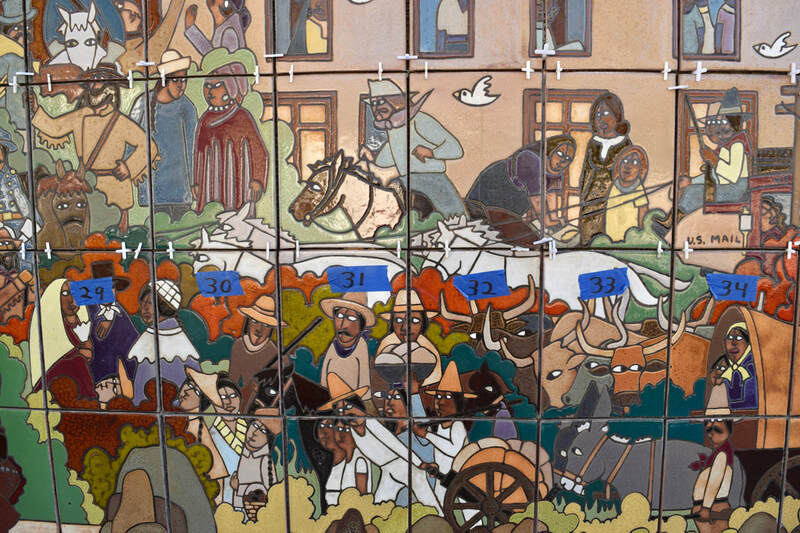 He also did some beautiful murals for one of his favorite Mexican Restaurant's (El Faro) in the mission district where there some magnificent scenes of the Latino culture . 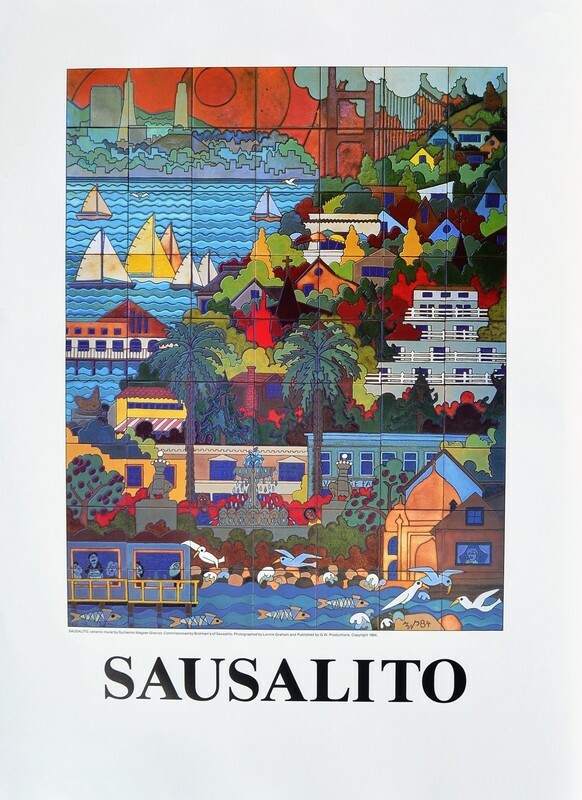 In 1984 he was commissioned to do a mural of Sausalito for the annual Art Festival. 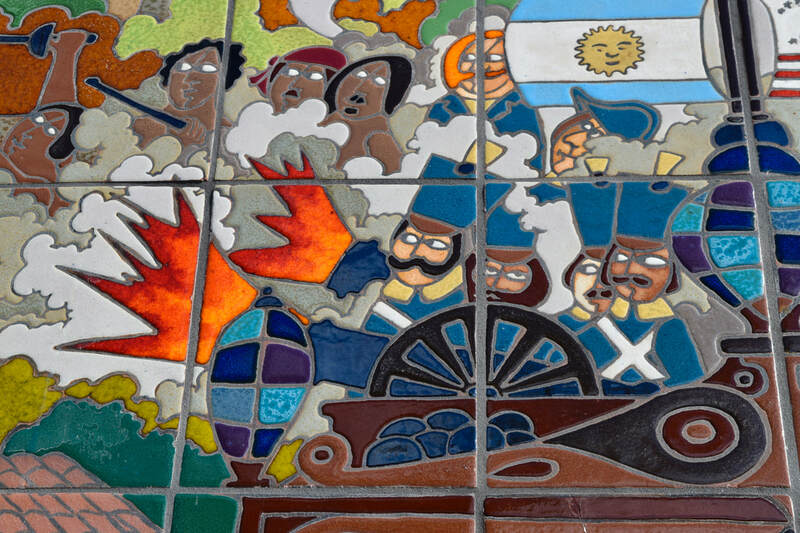 Granizo lived near the Santa Cruz for about 8 years. During that time, he gained an appreciation for this beautiful California beach town with an eclectic culture. 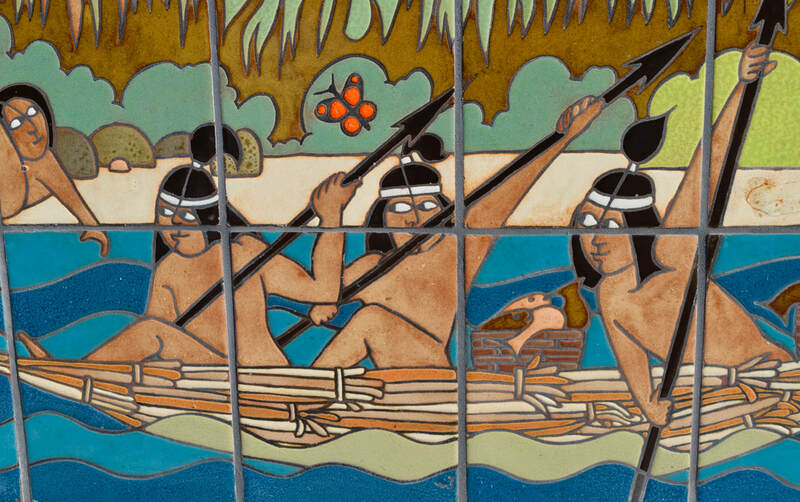 This community was the perfect background for another beautiful mural that now adorns the main entrance inside the Santa Cruz Civic Auditorium. 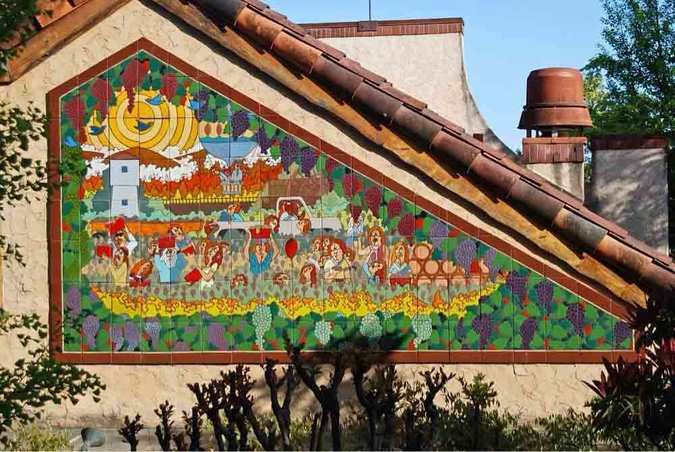 As with all the cities Granizo was commissioned to do, the murals for Vacaville also contained significant imagery about the area and the towns history. 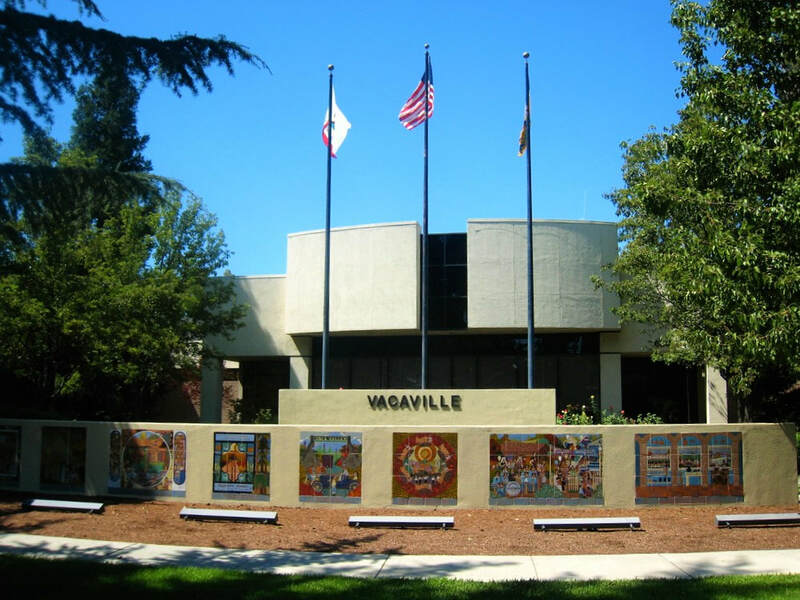 His focus was always on the history of the areas he painted and Vacaville is an important part of the early development of California. 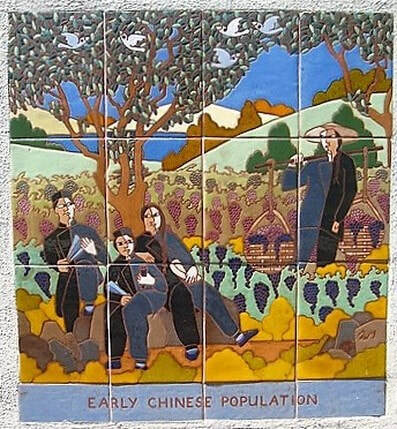 The murals displayed below are located in front of the Vacaville Civic Center.